This week, we are moving the last bit from our condo to the new house. Things are all over the place, so I usually like to do all the prep work as much as I can when I get a chance to be in the kitchen. With this meal, it might look like a lot of work, but it was a lot easier than it looks. I made the filling and chopped the vegetables for the soup in advance. I placed them in the refrigerator and when it was time to eat, I just preheated the oven and started wrapping the samosas. By the time I was done, the oven was ready for me to pop them in. While I was waiting, I just cooked the soup. Dinner was ready in 20 minutes. 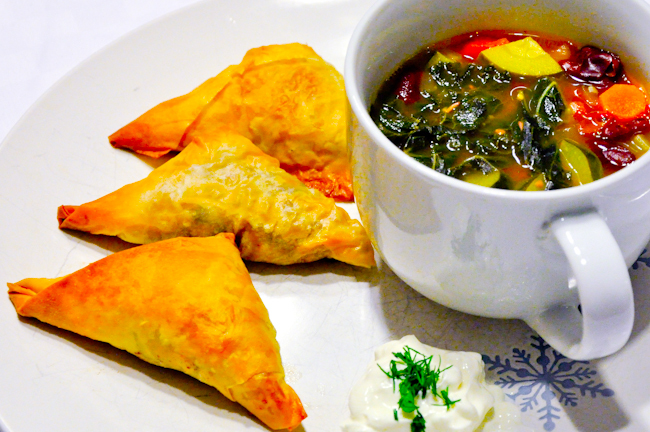 These samosas are also great as finger foods for any holiday get together. You can make them even smaller if you cut the phyllo into thinner strips. When you prepare the kale, save the baby leaves for the salad in the next meal.